This is a power point presentation I made for my eight graders to teach about direction. The above printable, downloadable handout is a great resource for high school students at Pre-intermediate (A2) and Intermediate (B1) level. It is valuable for teaching Formal and informal English (politeness or colloquial language) in English, and is a valuable material for enhancing your pupils' Speaking skills. 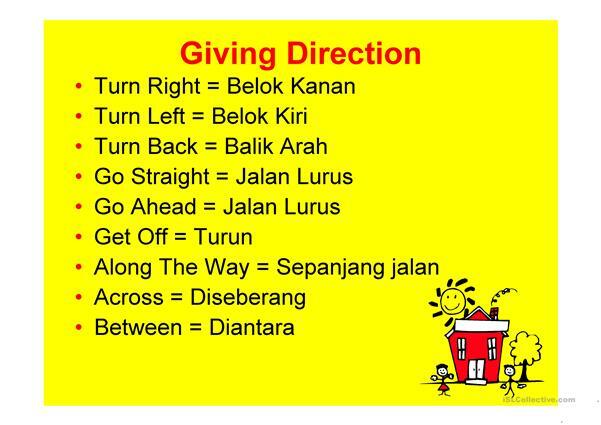 It features the vocabulary topic of Giving Directions. yuliasyam is from/lives in Indonesia and has been a member of iSLCollective since 2012-08-01 06:08:25. yuliasyam last logged in on 2012-08-02 04:43:50, and has shared 1 resources on iSLCollective so far.